Mackinnon, C. Stuart. "Portage". The Canadian Encyclopedia, 25 September 2015, Historica Canada. 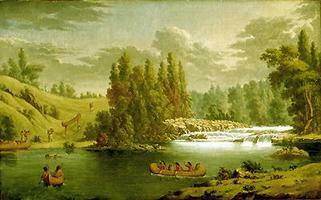 https://www.thecanadianencyclopedia.ca/en/article/portage. Accessed 23 April 2019. The first trails around waterfalls and rapids were often made by moose. Then Indians used the same paths, carrying their marvellously light birchbark canoes. The organized fur trade required the transport of heavy goods. 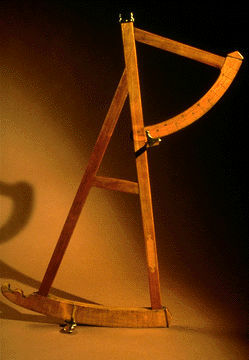 Voyageurs were expected to hoist 2 packs (pièces), each weighing about 41 kg. The first was slung on the back with a tumpline across the forehead and the second was placed on top. It was fatiguing work, usually done at a slow jog to reduce the strain on the back. On a long portage, the voyageurs would dump loads at poses every kilometre or so and go back for more loads. Two or 4 voyageurs would combine to carry the North or Montréal canoes, and when heavy York boats came into widespread use in the 1820s, portages were often equipped with rollers. Packhorses were used on the trail to Fort Assiniboine and across the Athabasca Pass. Oxcarts were needed for the heavier freight on Portage La Loche and at Fort Smith. In eastern Canada, canals and roads improved and supplemented water routes. At Niagara and between Montréal and the Richelieu River, early "portage railways" were a partial answer to transport needs (see railway history). The Grand Trunk Railway in the 1850s and the Canadian Pacific Railway in the 1880s marked the shift to continuous land transport across southern Canada.